It May Only Be An Old Police Car, But….. The primary fundraising event for the Los Angeles Police Museum (LAPM) is the annual Jack Webb Awards Dinner. This year’s gala will be held on Wednesday, June 30th, from 6:00 to 10:00pm, at the Petersen Automotive Museum, 6060 Wilshire Boulevard, Los Angeles, CA. The net proceeds from this special event provide the funding stability necessary to operate and continue to develop the LAPD Museum and Community Education Center. The theme, ambience, displays, and even the food are all venue-specific and have all been carefully selected this year to present an especially enjoyable, memorable evening. Business and/or cocktail attire will afford a revised, relaxed dress code. Additionally, several incredible, deserving honorees will be recognized. There will also be both silent and live auctions, ample refreshments and spectacular entertainment. Don’t miss the most dramatic Jack Webb Awards Dinner yet! Please contact Scherr Lilico, “The Proper Image” event management, regarding ticket purchases and sponsorship opportunities: (818) 994-4661 or fax (818) 994-6181. February 28, 1997 was a day of extraordinary courage and hellacious terror in the City of Los Angeles. At 9am North Hollywood Officers Loren Farrel and Martin Perello witnessed a robbery in progress at Bank of America, 6590 Laurel Canyon Boulevard. The next 44 minutes would forever alter the lives of countless officers and private citizens as the streets of North Hollywood became a war zone. When the shooting stopped, 11 LAPD Officers had been injured (nine by gunfire), seven civilians had been injured (two by gunfire), eight police vehicles had been damaged (two destroyed by gunfire), over 1,100 rounds had been fired by the suspects, over 500 rounds had been fired by police officers at the scene, $350,000 had been stolen and recovered, and the two suspects lay dead. Five police agencies and 350 officers were ultimately involved. The two perpetrators, Larry Phillips and Emil Matasareanu, both ex-cons with extensive violent criminal records, had come to the bank that morning with a death wish. Captain Jackson and wish him continued success in his new assignment. We also take this opportunity to “Welcome Aboard” Captain Mo Smith, a seasoned LAPD veteran and proud addition to the Northeast Area communities. The Los Angeles Police Revolver and Athletic Club (LAPRAAC) is seeking your assistance for a very important, long-term project. LAPRAAC is preparing a detailed written and pictorial history of the Athletic Programs sponsored by the Revolver Club since its formation in 1930. The story of the Revolver and Athletic Club and the Police Academy is one of the most fascinating in the history of the Los Angeles Police Department. It is integrally intertwined in the very fabric of this great organization. In the Winter Edition of the Retired Fire and Police Association Newsletter, Director Mike Dwyer paints a fascinating, accurate picture of the essential role and major impacts that both the Police Academy and the Revolver Club have had on our collective well-being. But the picture is incomplete. LAPRAAC, which has partnered with and supported LAPM for many years, now needs our help. Please send your photographs and stories to LAPRAAC, Attention: Barbara Ginn, P.O. Box 861148, Los Angeles, CA 90086-1148. Barbara can also be contacted at (323) 221-5222 x200, or fax (323) 222-5949. This is a wonderful, compelling story that needs to be told; please help! In an effort to name the cuddly little bear now available in the Museum Gift Shop, LAPM is making the following exclusive offer to members. Submit your proposed name(s) to LAPM by e-mail to claudiadiaz@earthlink.net no later than 12:00 noon on Wednesday, March 31. A panel of Board members will select the best entry. If your entry is selected, LAPM will extend your Regular Membership one year free of charge. If you are not currently a member, you can become eligible to enter this contest by joining LAPM prior to the deadline. If the name you submit is chosen, a one-year Regular Membership ($48.00 value) will be awarded to you. Copyrighted names are ineligible (i.e. Winnie The Pooh). These little bears make wonderful gifts for any occasion; they can be purchased for $4.95 each plus tax at the Museum Gift Shop or on-line at LAPM.COM. The winner will be announced by mail and on the LAPM website. Be sure to include your full name, mailing address and telephone number when submitting your entries. Steven Kasten has lived in Southern California since the age of ten. He grew up in Santa Monica, graduated from Santa Monica High School, and then went on to study business and real estate at Santa Monica City College, Pierce College, and California State University, Northridge (extension). In 1968, he founded Steven Kasten Properties in Lincoln Heights, which he still owns. Since then, he has participated in a number of community-oriented organizations in East Los Angeles. “I’d been very active in real estate and started to join volunteer groups,” Kasten says. In the early 1980s he served on the Board of Directors and was President of the Police Business Association of Hollenbeck LAPD. “That’s how I got involved with law enforcement.” It was a joint project between the business community and the police department. He also became involved with the Hollenbeck Youth Center which focused on helping children learn to enjoy sports. “A couple of the officers I worked with were on the Board of Directors of the Los Angeles Police Historical Society and asked me to join,” Kasten recalls. Since 1989 he has been on the Board and served as Chairman from 1997 to 2002. When Kasten first became active in LAPM, he knew it would be more than just a museum. “The reason I got involved was because not only did they want to build a museum, but also a community and education center that would educate people about what police officers do and how they help citizens,” Kasten says. “I knew it would be a place where citizens can come and get to know the officers. I’ve met officers—from those who patrol the streets all the way up to the chief of police—and they are all outstanding people. We have the best-trained police officers anywhere. They are very ethical and professional, and people need to understand that. Just from interacting with so many officers I have a true admiration for them.” “Most individuals do not get to interact with police officers like I do. Most of the time when people interact with them it is in a negative way, for instance, to receive a traffic ticket. I get to meet them on a normal day and see what they do day in and day out. That is what I would like other people to experience,” Kasten adds. “I think this museum can make that happen for civilians. When more people get to meet officers and understand what they do, their respect will grow.” He believes that many negative incidents between the police department and the community can be avoided when civilians and police officers interact positively. on the Board of Directors since then. From 1989 to 1999, Kasten was on the Foundation Board and Governing Board of the White Memorial Foundation . He also served as its Chairman. Kasten has been on the board of the Lincoln Heights Chamber of Commerce since 1980. He served as President for 15 years. He was named Honorary Mayor of Lincoln Heights from 1982-1984 and from 1990-1991 and received the Man of the Year Award in 2003. Also captured are the unheralded bravery and uncommon valor that triumphed that fateful day over evil incarnate! 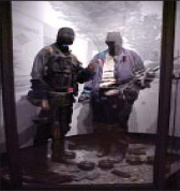 Custom-made, life-sized mannequins of the two suspects are completely outfitted with the clothing, body armor and actual weapons they possessed during this infamous event. The diorama in which they are showcased will cause the hair on your neck to bristle! This is but one example of several professionally developed exhibits that are in progress at your Museum. The most important gallery exhibit we will ever develop, the Fallen Heroes Tribute, has been designed, but we need your assistance to help fund its creation! If every officer and civilian employee gave just ten dollars toward this exhibit, it would be fully funded. We each spend that much every day on lunch! Please consider a donation to LAPM. These are our LAPD heroes; they deserve our best! Call (323) 344-9445 for information regarding a designated donation. back into the pneumatic tube to return to Communications. Whew, it makes me tired just recounting it. One thing you did develop, though, was a talent for conversationally “holding” your suspect at the scene while you waited for the return, particularly when they had an “urgent appointment” and wanted to leave. It required some real filibustering to hold onto your quarry. I just realized that I have rambled on for quite awhile simply because I was checking out one of many exhibits at the Museum. I’m sure these ruminations brought back a lot of similar memories to many of you. A visit to our place up on York Boulevard will undoubtedly have the same effect. Not only is it fun to look back, but it really makes us appreciate the incredible strides that law enforcement as a whole, and the Los Angeles Police Department in particular, has made through the years. I don’t know about you, but for me, it also tends to reaffirm my feelings of how lucky I was to be a member of this great organization. The Los Angeles Police Museum, a non-profit corporation, seeks a paid part-time Volunteer/Outreach Coordinator to identify, develop and implement recruitment strategies and methods to attract and retain a sufficient pool of volunteers. Areas of repsonsibility: Recruit, train, develop and retain highly dedicated museum, office, and event volunteers. Coordinate ALL volunteer activities (training, placement, recognition and evaluation). Work with other Museum staff to identify volunteer positions and develop accurate position descriptions. Requirements: This postiton requires a highly motivated, well-organized, detail-oriented individual. A demonstrated commitment to community volunteer service and a background in the non-profit world are desirable. Strong communication skills. Good listening skills and diplomacy. Ability to motivate others and encourage them to get involved and follow-through on projects. Send resume to: Los Angeles Police Museum, Attn: David Dalton, Executive Director Mail: 6045 York Blvd., LA, CA 90042. Fax: (323) 344-9516. No phone calls please. *Closed on Holidays. Facilities may be closed temporarily on other days at the discretion of the Board of Directors due to special circumstances (i.e. on-site film production). Call (323) 344-9445 and ask about our L.A. City Payroll Deduction Program.